There are many layers and many body parts that we work in Pilates. A big focus is on working the core and working deeply. Working this one deep core muscle is key to being sure you get the most out of your sessions. It will help you get the core support that you came for. 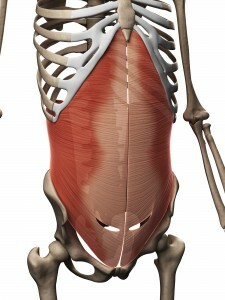 This muscle is the deepest of the 4 layers that make up your abdominal wall. It sits closest to your spine and connects from your ribcage down to your pelvis. The fibers of this muscle run horizontally, so this muscle expands and contracts, much like a corset loosening and tightening around the waist (it’s like your inner weightlifting belt). As you inhale this muscle expands outward, allowing air to enter your body. As you exhale it contracts inward, helping you to push air out of your body. Anatomy books will tell you that this muscle compresses the abdominal contents. It helps you poop, vomit, and it contracts when you cough, amongst other lovely bodily functions. It also acts as a major core stabilizer. What the anatomy books don’t tell you is that this muscle is an axial elongator. Meaning when you engage the TVA deeply, it decompresses the spine. Similar to when you squeeze a tube of toothpaste in the middle, the toothpaste moves up and down. Engagement of the TVA allows your spine to lengthen from end to end and it helps to create space between each vertebrae in your spine. How often are you engaging your stomach muscles throughout the day? For most of us, it’s minimal- that’s why connecting with this muscle while you’re in Pilates (your 1 hour session) is SO important. Just to drill the point home: The abdominal wall can be developed outward or inward. Connecting with your TVA and pulling your abs back while working your core will help you create a nice inward support structure for your lumbar spine. As an added bonus, it will help you to look more slender svelte! Here is a simple TVA routine. Find a neutral pelvis and neutral spine (hip points and pubic bone level while low ribs are connected to the ground). If you feel any neck tension, place a small pillow under your head. Exhaling, allow your belly to naturally gather inward toward the center of your body. Continue pulling the belly back and engaging your TVA as if you’re squeezing out a sponge inside your belly. Repeat steps 1 & 2 50 times (yes, 50 times- it’s SO worth it). Take your time and get a full inhale and full exhale. Exhaling, allow your belly to naturally drop down toward the spine. Squeeze out that imaginary sponge inside your belly. Hold the engagement of your abs back and count out loud for 30 counts (this will assure that you are breathing). Focus on breathing into the ribs, while maintaining that TVA contraction. Once you’ve reached the count of 30, release the abs. *While doing these exercises, no movement should happen in the bones of your pelvis or your spine. Maintain that neutral position and just let the soft tissues of your belly and waist move. Stand up and see how you feel. My spine always feels more supported and I feel taller after I’m finished with these simple exercises. If you want to switch this up, try it seated or on all fours (one of my favorite positions to work the TVA). How do you feel? Leave a comment in the box below to let me know. Throughout your Pilates sessions, tap into your TVA. Continue with the deep work and let me know if you feel a difference in how you feel and how much you get out of your sessions.